It has been rumored that both Apple and Samsung are working on utilizing a dual-camera setup on future smartphones. However, little information is known about what such a setup would offer. Thanks to a recent patent application, we have a good idea where Apple is heading with this tech. Apple’s “Mobile Camera System” patent was recently published at the United States Patent and Trademark Office. It a nutshell, it’s a system for using multiple cameras to provide optical zoom, which is likely to appear on a future iPhone. This setup includes two cameras, each set to a different focal length. The user could switch between the two cameras, and in some cases, the images from each lens would be combined or preserved separately. Optical zoom is something that is only reserved for standalone point-and-shoot and DSLR cameras. Smartphone cameras only offer digital zoom, which means that zooming in is actually a form of cropping since it lowers the resolution. For example, if your smartphone has a 12-megapixel camera, you might end up with a 5-megapixel photo after digitally zooming. Optical zoom allows you to get closer to the subject while retaining the full resolution. This means that your zoomed-in photo would still be at 12-megapixels. 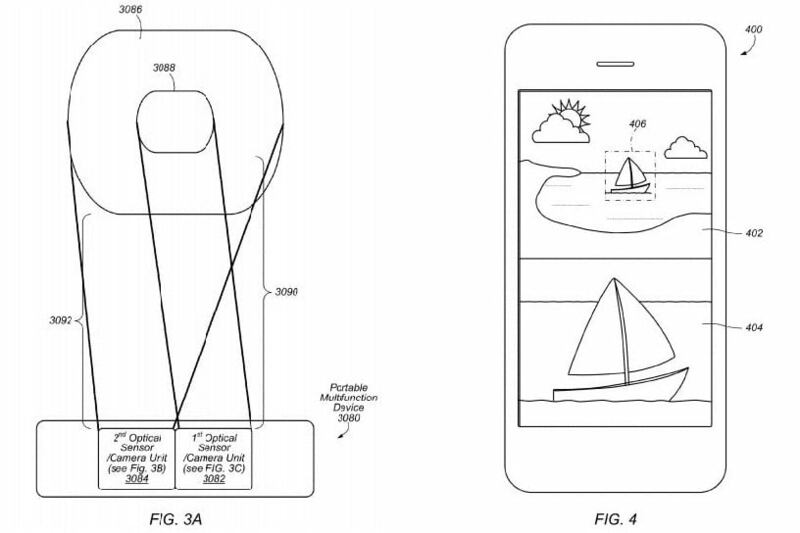 Apple isn’t stopping at optical zoom as the patent suggests other cool features. Users will be able to record slow-motion video using one camera and normal speed video with the other. The combination of the two could make for some interesting edits. Apple also plans on allowing users to capture stills and video at the same time. This is already an option on the iPhone now, but a dual-camera setup would allow for full resolution images to be captured at the same time, not to mention different focal lengths. This means the images from one camera could be zoomed in while the video is zoomed out on the second camera. An example in the patent is a baseball game in which the user films a batter from further away with one camera, while the second camera captures closeup photos of the batter as he swings. The second camera could also record video instead. Users could also record and save video at different resolutions at the same time. For example, you might be utilizing 1080p video today, but you could record 4K video at the same time so its ready when you buy that new TV. We must stress that not all patents come to fruition, but there’s a good chance for this one since Apple has been a pioneer with cameras on its iPhones. The only question left is if this dual-camera setup will appear on the iPhone 7 and/or iPhone 7 Plus? We’re hopeful the answer is yes.